For the kindergartner’s birthday party I busted out my free frozen turkey (work perk!) and had my ways with it. Not a green bird, unfortunately, but a freebie, and I cannot resist crisp poultry skin. I cut off the breasts and brined and roasted them for the celebration: 1 cup brown sugar, ½ cup kosher salt, several garlic cloves, smashed and peeled, 3 bay leaves, ½ cup or so of fresh ginger, chunked and smashed, a handful of fresh thyme sprigs and a spoonful of allspice berries, crushed, all brought to a boil in a few cups of water. Add ½ cup maple syrup and ½ cup soy sauce plus ice and a quart or so of cold water. Brine breasts in mixture in the refrigerator for a day and a half. Pat the breasts dry and roast at 350º until done. Chill well and slice very thinly. Party! Working the rest of the bird, the legs quarters went into the slow cooker with a bag of frozen broth scraps. For turkey tacos, we shredded the dark meat and stirred in some green salsa to fill Margarita’s corn tortillas nuked up with Full Quiver Farm‘s cheddar. The wings got roasted, as did the back and torso, plus loose fat chunks. Lots of crispy skin and swoonful eye rolling at that point. Roasting pans were deglazed with leg broth. Now the freezer holds savory promises of gravy and stir-frys. And that bag of giblets? 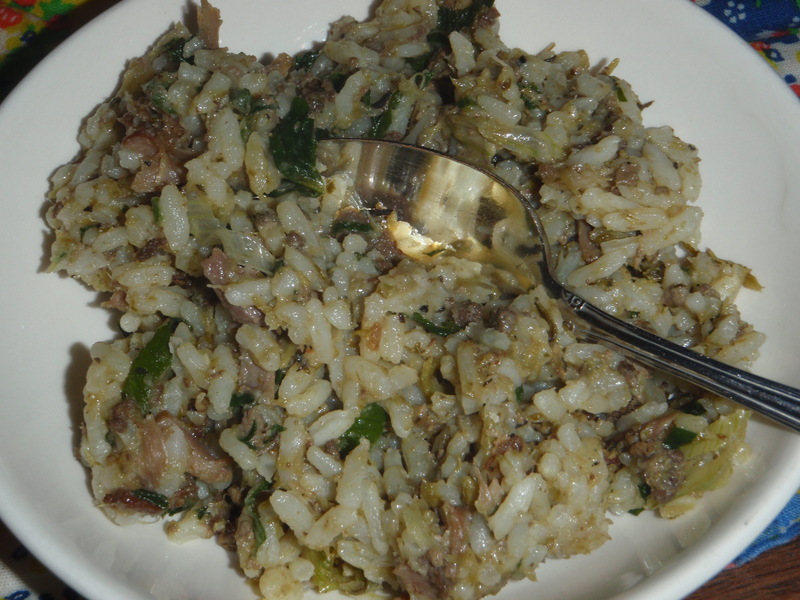 Those offal parts found their calling in a pot of rice, like so many foods around this house. about 3 Tablespoons bacon grease. Mine’s leftover from Dai Due‘s smoked Richardson Farms pork belly. finely chopped organic or local celery, at least a cup. I haven’t had local this season. If you go to the HOPE market, check out Finca Pura Vida, my previous source. Say “Hola” to Edgar for me! Otherwise, Newflower Market’s selling organic celery for only 99¢ a bunch, through March 17.
chopped local onion, a cup or so. Did I really just cook through a year in Central Texas with an uninterrupted local allium supply? We have arrived! 3 or 4 cloves domestic organic garlic, minced. I just bought young garlic from Hairston Creek Farm and Montesino on Saturday. Get local if you’ve got it! 2 cups pepper broth, more if necessary. In season this dish requires bell peppers. I’m making do with my liquid capsicums right now. Most any rich broth will work. 2 bay leaves. Fresh is best, so get growin’! generous handful fresh local parsley, widely available, from Central Market to the farmers markets to maybe your own backyard. several local green onions, chopped. Plenty to choose from at our farmers markets. Trim the giblets (remove any excess fat and cut the tough membrane off the gizzard) and cut the neck into 2 to 4 pieces to fit in your pan. Grind the gizzard and heart in your food processor. Remove and set aside and then puree the liver. Heat up the grease on medium-high in a large (3-quart size is good) saucepan. Brown the neck pieces well and then add the gizzard and heart mixture. Stir and brown then add the liver and brown some more. Add the celery and onion and saute until translucent, stirring in the dried herbs as well. Stir in the garlic until fragrant, then pour in the broth. Add the bay leaves and salt and bring the mixture to a boil. Cover the pan, lower the heat and simmer for about 45 minutes, until the neck meat is tender. Meanwhile, cook up your rice . See Jasmine Rice. Remove the cooked neck pieces from the pan and let them cool a bit on a plate. If your meat mess is too soupy, boil it down some, uncovered, over high heat to evaporate the excess broth. Pick the meat from the neck and add it back to the pot. 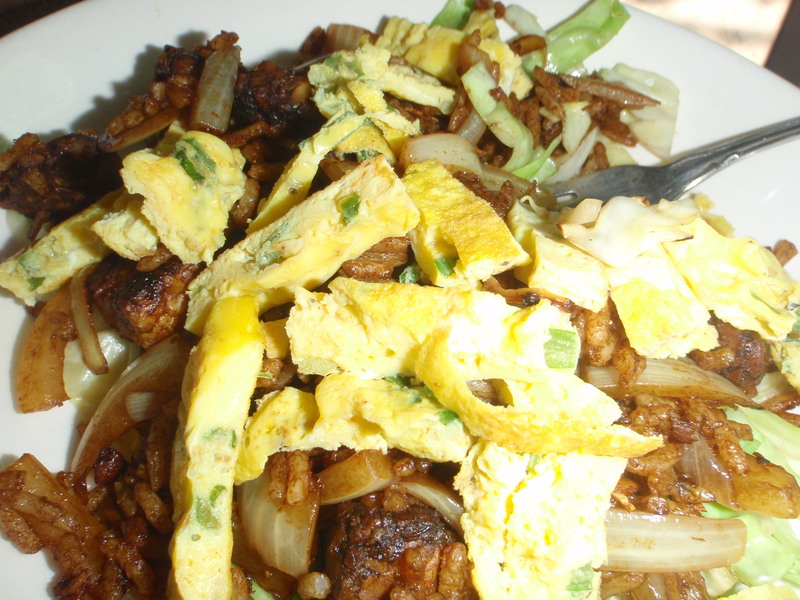 Taste for salt, stir in the parsley and green onions and black pepper. 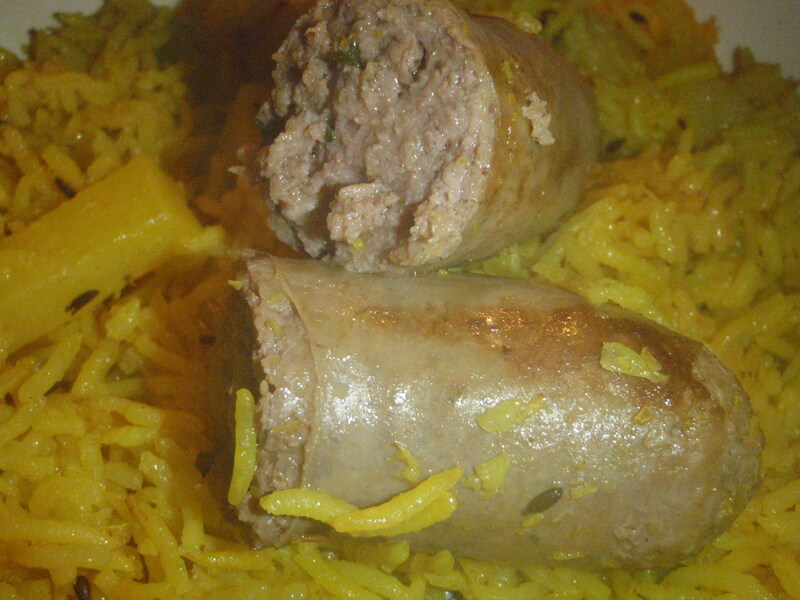 Fold in the hot rice. Post-kindergartner’s birthday party, the cook needed a break. Cans to the rescue! This easy and nutritious Jamaican inspired one-pot dish, adapted from a recipe served by friend and coworker Suzanna (of SouthAustinFoodie Adventures) several years ago, hits the spot without breaking the bank or my back. Right now—and tomorrow, too—Whole Foods is selling Lowell Farms Texas-grown organic jasmine rice for only 99¢ a pound. That’s even cheaper than ordering from the farm! 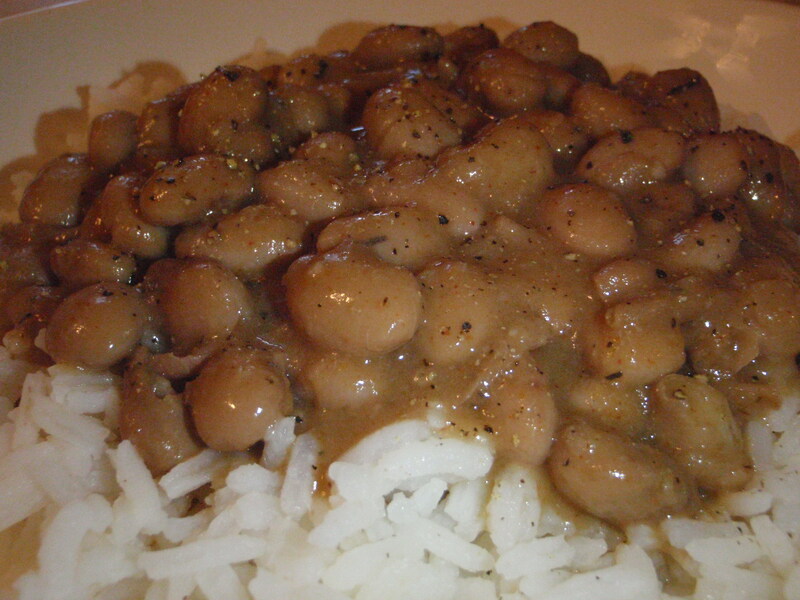 Stock up on this truly gourmet Texas staple and be prepared to sophisticate your starch. Or just lowbrow your lunch. 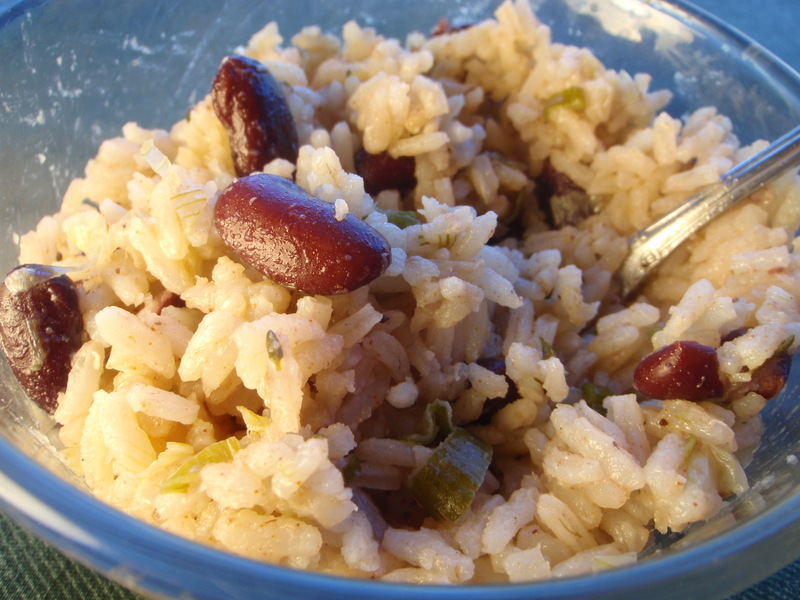 Delicious across the spectrum, and even recommended by Jeffrey Alford and Naomi Duguid of Seductions of Rice, this righteous rice hits the spot quick! 1 15-ounce can organic kidney beans, drained. Reserve liquid for cooking your next batch of homemade beans or soup. Whole Foods and Central Market brands generally sell for less than national brands. 1 13-14-ounce can organic coconut milk, light or regular. Whole Foods brand usually sells for the best price. 1 cup water or broth. Pepper broth pairs perfectly here. Carrot cooking water (never throw it away!) lends complementary sweetness. a Tablespoon or so of fat—I like using leftover pig grease, such as from Dai Due‘s yummy salt pork. ½ Tablespoon or so minced fresh domestic organic ginger root. You may already know that I almost never peel ginger. It’s your call though. stalk of Texas-grown spring onions (leftover from using the bulb portion for another purpose), quartered, core reserved for the stock pot, and thinly sliced. If the farmers markets have eluded you recently, Central Market’s selling these for $1.69 for a triple-bunch. 2 bay leaves—fresh if you’re growin’. This bush is easy enough that you oughta cultivate it yourself. You’ll love the deep aroma of fresh bay leaves. hot chile, if you got one—habanero or Scotch bonnet work well for this, but serranos are fine, too. Seed (if desired) and mince your pepper. 5 sprigs of fresh thyme. Easy to grow, just ensure adequate drainage. If you’re fresh out of fresh thyme, ½ teaspoon dried thyme will suffice. 1 teapoon salt. I like Real Salt. ¼ teaspoon ground allspice. I crush mine in a small mortar and pestle. In a large (’bout 3-quart) saucepan, heat up your grease over medium-high. Saute the ginger root, bay leaves, onions and peppers if using. 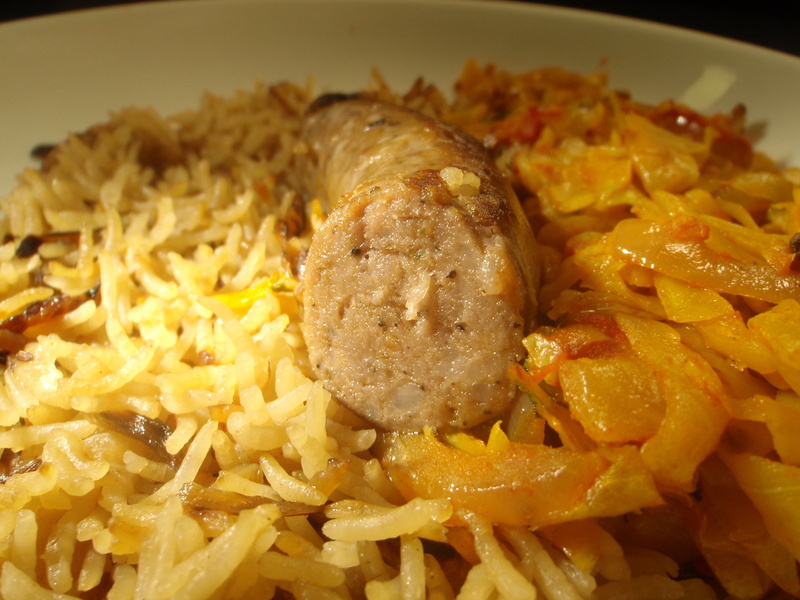 Add the thyme and rice and stir around. Pour in the coconut milk and broth and stir in the salt and allspice. Bring to a boil and stir in the beans. Cover and simmer on LOW for 20 minutes. Remove from heat and let sit for 10 minutes before fluffing. Serve with hot sauce or hot pepper jelly for a tangy or sweet hot kick. I recently read about Carla Crownover‘s “No Grocery Store Challenge for a Year” on the Austin Farm to Table blog. 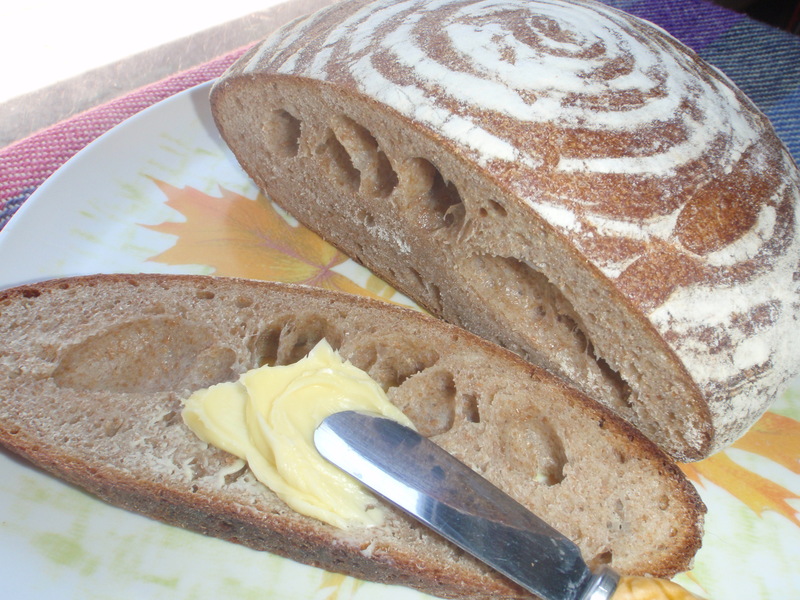 Inspired by her quest for bread, I began developing a 100% wild cultured sourdough starter with Richardson Farms locally-grown, fresh-ground whole wheat flour. I succeeded in baking up two small, but well-risen loaves, sweet(!) and tasting nuttily of fresh wheat. I strengthened the dough with organic white flour for my wild starter’s virgin attempt at leavening, intending to advance to a 100% naturally leavened, 100% whole wheat loaf next. Despite the confidence-building rise of these initial breads, however, the light bulb part of my brain flickered and I thought, why not just sift out most of the bran from my whole wheat flour? The sharp edges of the bran particles slice into the dough’s gluten strands, reducing volume and creating a denser texture. Less bran=lighter loaf (not factoring in additives ). Plus, according to BBC’s TV program Gardener’s World, bran is the best slug deterrent. You needn’t throw it away. Apparently the gooey pests eat it up and expire. And then your chickens gobble the slugs. Gotta love that food chain! Here’s a not-necessarily-but-possibly totally local sandwich loaf (except for the salt—only Tuscans can get away with saltless yet edible pane, and yeast). 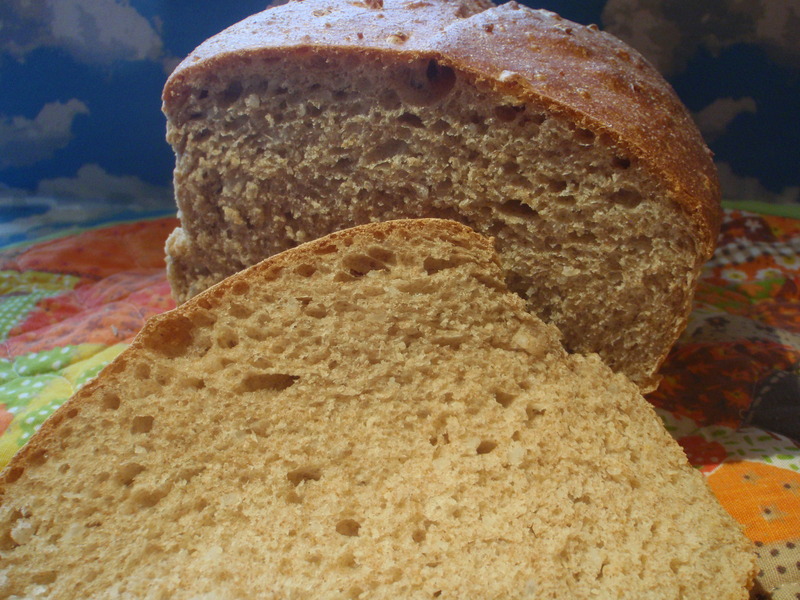 Light-textured and wheaty, this bread makes fine sandwiches, fluffy/crisp toast and of course, an accommodating base for a thick swath of butter. ½ cup local milk, scalded, plus enough water to equal 1 generous cup. I use either Swede Farm Dairy or Wateroak Farm goat milk. 1 teaspoon local honey. I buy Good Flow in bulk at Central Market. Bring your own container and ask an employee to tare the weight for you. 1 Tablespoon organic butter. I usually use Organic Valley. Click for a coupon. For the totally Texas taste, try local butter from Elevated Artisanal at the Austin Farmers Market or Way Back When at both the downtown market, the Sunset Valley Farmers Market and from Greenling. I used the bread machine to mix and knead the ingredients. Place the ingredients into your bread machine in the order indicated by your instruction manual. In my machine, that would be the order listed. When the machine stops, take the pan out, cover it with plastic and let the dough rise. A cooler first rise promotes flavor development, so I banished the dough to the cold laundry room for a couple hours. With buttered hands, press the dough down and shape it into a loaf. 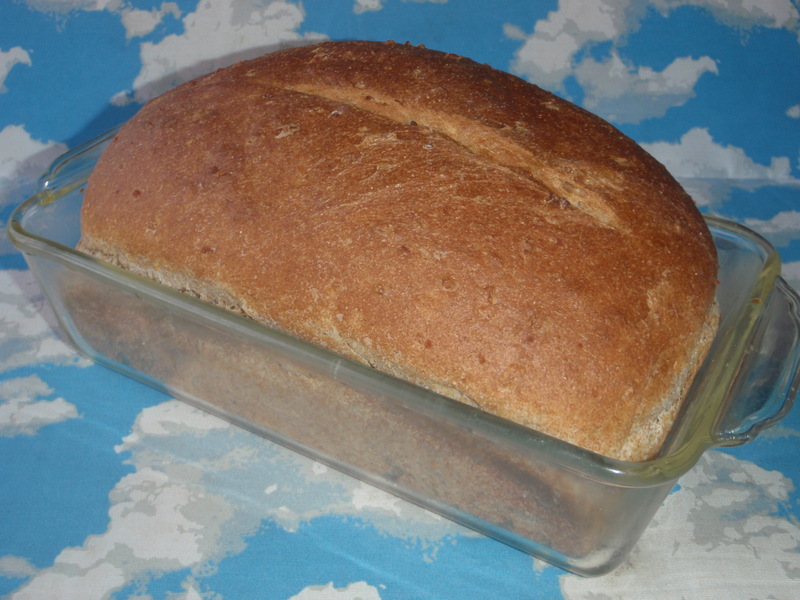 Cradle your bread baby into a buttered 9″ X 5″ loaf pan, cover the pan with a very large upturned bowl and let rise until the dough feels puffy when you poke it. It should be risen to 1″ over the edge of the pan in the center. Slash the top of the loaf and bake in a 350º oven for about 40 minutes, until well-browned. Remove the loaf from the baking pan and let it cool on a cooling rack before slicing.